I’d heard some time ago about the release of Coca-Cola with stevia, however it was only last week I actually saw them on sale. It’s easy to recognise as it comes in a green can. 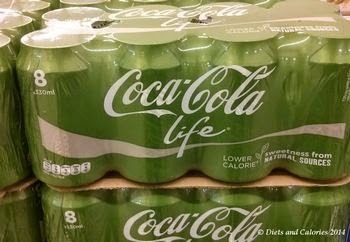 The new Coke is called ‘Coca-Cola Life’ and is described as ‘a sparkling soft drink with vegetable extracts and sugar and sweetener’. It has 33% fewer calories than the full sugared variety. I’m not a fizzy drink consumer, but my son and his friends love the stuff. So I decided to buy a few to see what they thought. And of course, I had a small taste myself. 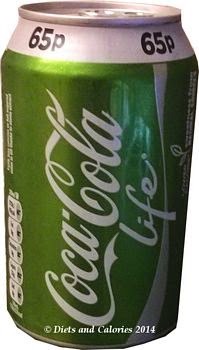 Coca Cola Life is basically the regular Coke but instead is sweetened with stevia AND sugar. I didn't realize this until I looked at the calories – 89 calories per 330ml can or 136 calories per 500ml bottle! Since Stevia doesn't have any calories, these calories are obviously coming from the sugar. I’m not really sure what the point of this is. They already have Diet Coke and Coke Zero etc., so why this one? OK, so stevia is a natural sweetener and the others are sweetened with artificial sweeteners. But still, each can has 5 teaspoons of sugar in it! I suppose the idea was to produce a Coke that tasted as close as possible to the original Coke. So I put it to the test. Everyone was keen to have a swig of the new Coca Cola Life. The verdict - most couldn't taste any difference between regular Coke and Coca-Cola Life. However, a couple said they could definitely detect some sort of after taste. I had some myself, but as I haven’t drunk the stuff for years, to me, it just tasted like Coke. So why buy this? I guess if you don’t like the taste of Diet Coke and you’re wanting to cut down on sugar and calories, you might like Coca-Cola Life. So you save 47 calories and 3 teaspoons of sugar by drinking Coca-Cola Life instead of regular (full fat). Ingredients: carbonated water, sugar, colour (caramel E150d), natural flavourings including caffeine, phosphoric acid, sweetener (Steviol glycosides). Yes and the reason I will try it. Aspartame caused me quite a bit of problems and even the diet coke with Splenda has removed those problems. Which would be better to drink though?